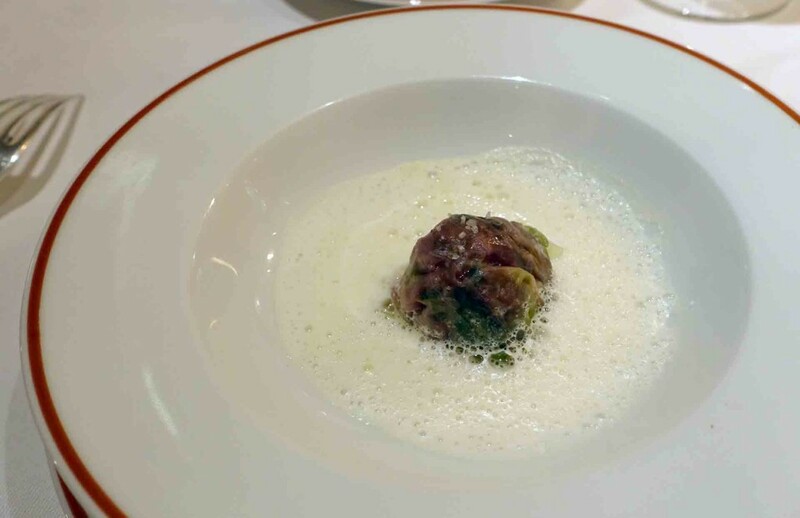 L’Arpège has been open since 1986 but in 2001 Alain Passard totally changed his focus from juicy meat and rich seafood to a menu centred around roots and leaves; a radically modern volte face. Passard’s philosophy is that a chef must have a relationship with the land that produces the food he serves for the dish to succeed. He looks for each course to affect each of a diner’s five senses. I can’t really attest to many of the dishes sounding particularly outstanding but in terms of appearance, smell, texture and most importantly taste 90% of the meal was bang on. 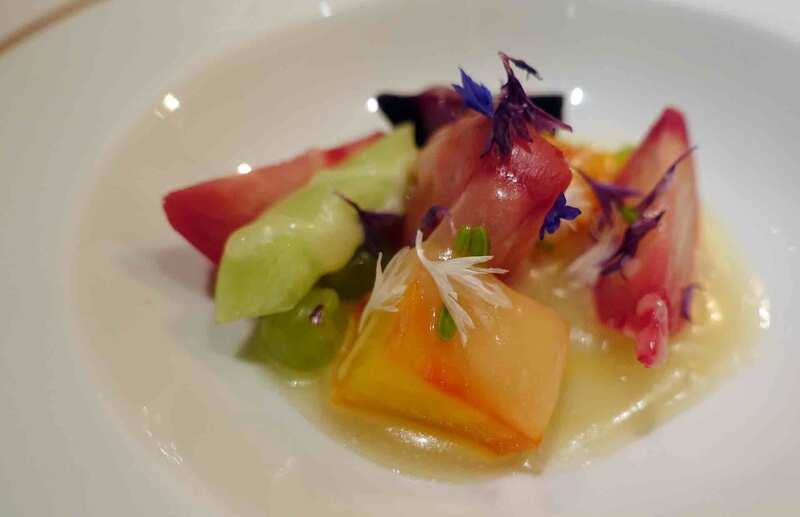 Our meal started with the most colourful canapes – crisp bases filled with intense and distinct flavours. I was very hungry when I arrived (something I suggest for a meal here…) so I wasn’t really concentrating on the ingredients which made up each tartelette but what I can remember is feeling very excited about what was to come after these first few bites. 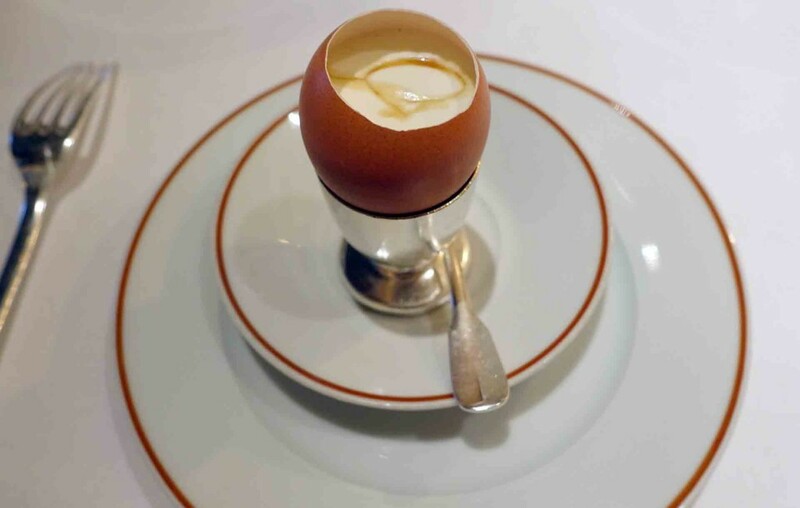 Passard’s signature amuse bouche followed – chaud-froid d’oeuf fermier, sirop d’érable – or a lightly poached egg yolk with a chilled, lightly frothed cream and topped with maple syrup. The cream was packed flavours including sherry vinegar, ginger, clove and nutmeg. The dish was perhaps a little too sweet for me so early on in a meal but I was impressed, given I am not a fan of cream, at how wonderfully light the dish was. Next up was a wonderfully fresh gazpacho with celery ice cream. 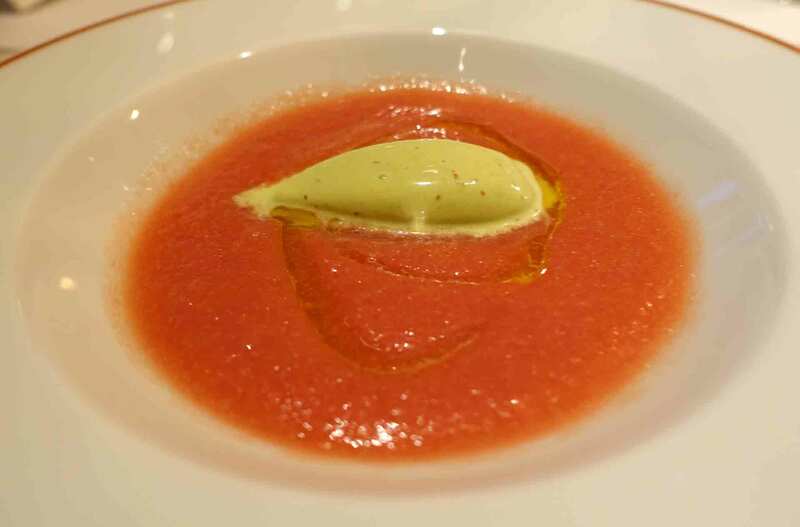 These flavour in the tomato soup was a very close rival to the tomato tart I had a L’Assiette Champenoise a couple of years ago (more here) which is still the best tomato dish I have ever had to date but this was an incredibly close second. 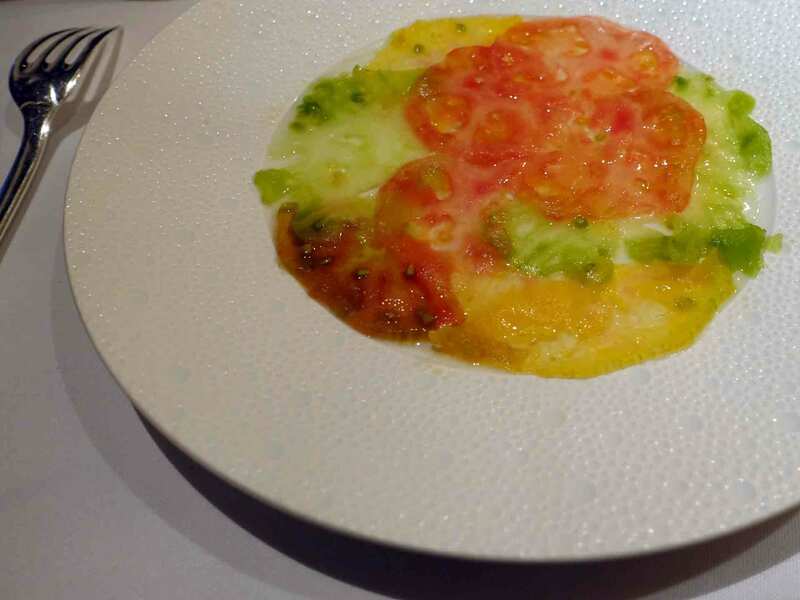 Building on the tomato theme, our next dish was tomato carpaccio. You could almost taste the attention and nurture that had gone into growing the vegetables when eating this dish. Passard clearly, and rightly, felt that there was no need to complicate the raw ingredients adding only a tiny bit of salt to enhance the flavour even further. Next up was a trio of beetroot with elderberry flower The distinctive flavour of each variety of beetroot really came through and the (just the right side of sweet) honey and elderberry sauce was a perfect accompaniment to the earthy tones of the beets. With the perfect note of horseradish this dish was rich and bursting with flavour and the texture akin to eating the ‘real’ thing. 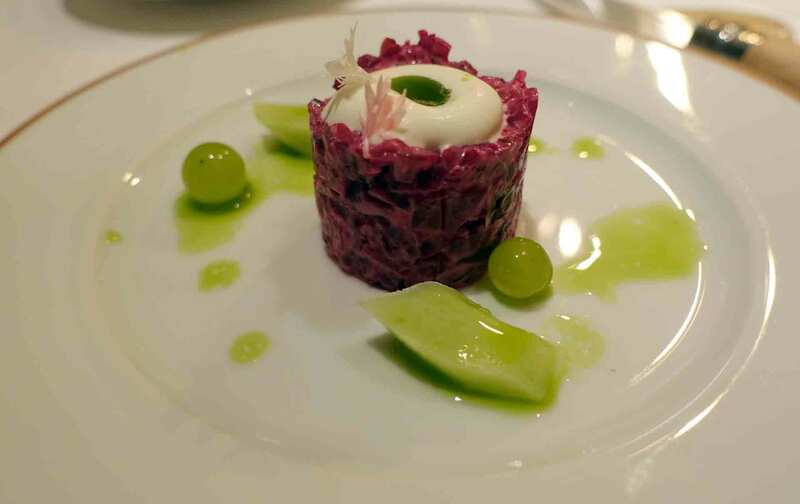 I would return to L’Arpège for this dish alone. 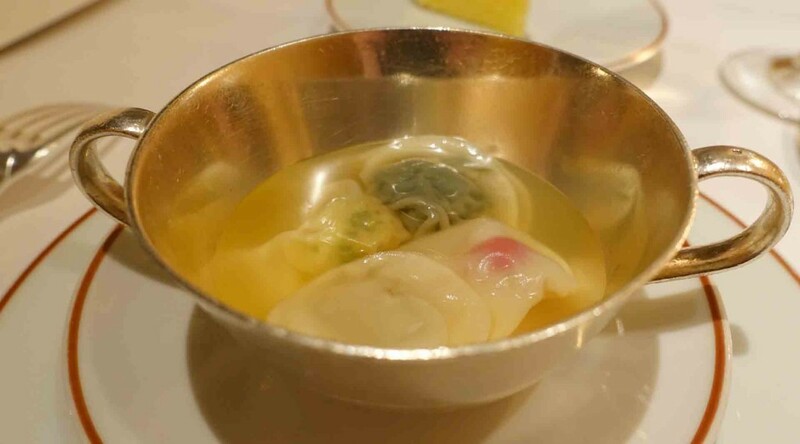 Next we were served ravioli in a delicious consommé. My memory escapes me on the filling for each individual ravioli, probably because this was my least favourite dish of the evening. While the pasta was melt in the mouth, the consommé was (for me) overly fragrant and this detracted from the flavour of the ravioli filllings. 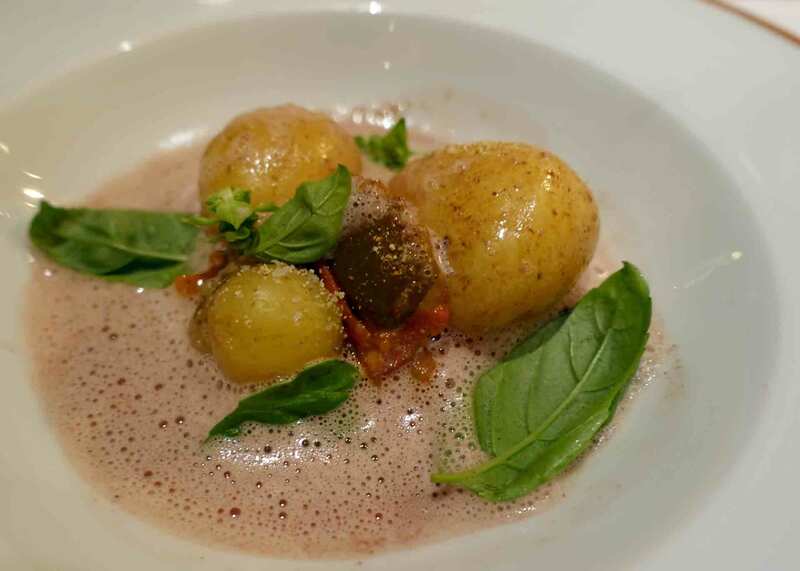 An incredibly simple yet flavoursome dish followed – new potatoes with kalamata olives. The potatoes were perfectly cooked (with just a little bite) and had an incredible flavour that managed to come through even when faced with the kalamata olive sauce. For those cheese eaters out there the dish also incorporated parmesan so it is possible that the potatoes may not have been able to contend with that but, given the dishes we ate throughout the evening, I can say with confidence that it would have balanced perfectly. Our first departure from purely vegetable based dishes was a delicious fillet of John Dory from the Gulf of Morbihan in Brittany. John Dory is not a fish I would usually pick out on a menu but this dish has converted me. The fillet was meaty yet light, and went perfectly with the crunchy french beans, courgette flower and intense salsa verde which accompanied it. A ‘meatball’ of rainbow Swiss chard was next. Surrounded by a light, creamy sauce (again incorporating parmesan for the cheese eaters) this dish was a real surprise – fresh flavours and a perfect palate cleanser. 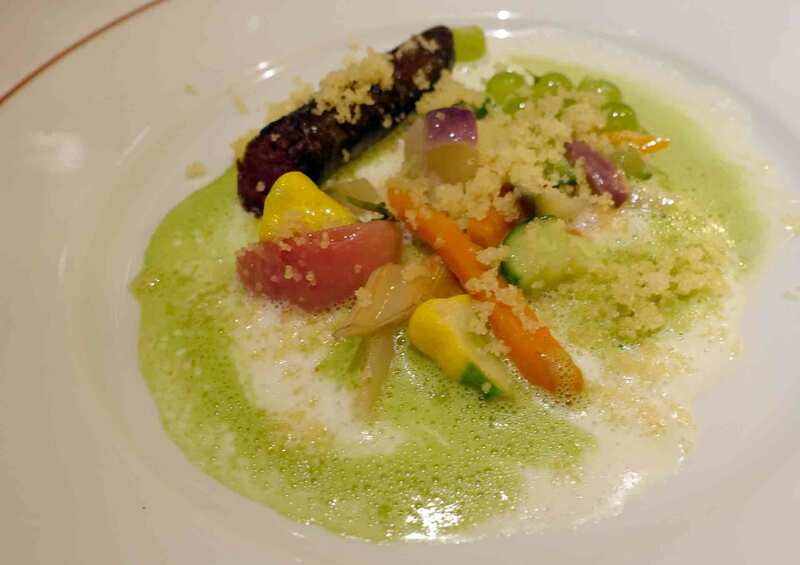 Another mock meat dish followed – Passard’s take on a spicy sausage with semolina in argan oil and vegetables. It was honestly hard to believe that the ‘sausage’ was not chorizo – the balance of the harissa and the texture of the cabbage really replicated the real thing but made it better! The al dente vegetables were again delicious. A vivid, clean and eye-opening dish. And the final savoury dish…I diverted slightly from the tasting menu at this point as the dish on offer was an innovative duck/chicken rotisserie. Not being a fan of duck this was not for me but if you do go to L’Arpège and it is on the menu I understand that you have to try it! Passard is renown for his rotisserie skills and apparently the way the flavours of the meats mix is just phenomenal – plus they bring the frankenstein bird to your table to have a look at and it really is a sight to behold! Anyway, instead I had a wonderful lobster with shallots and beans. The lobster was sweet and perfectly poached. 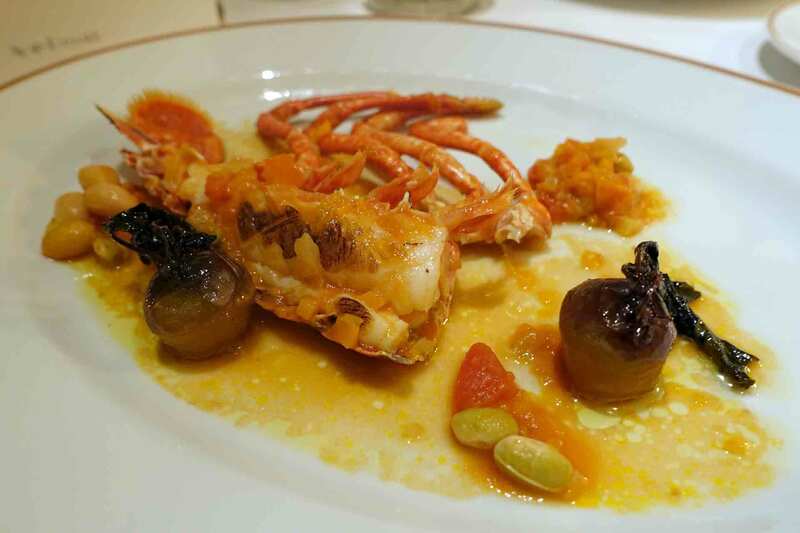 The delicious, rustic sauce contrasted perfectly with the rich shellfish. 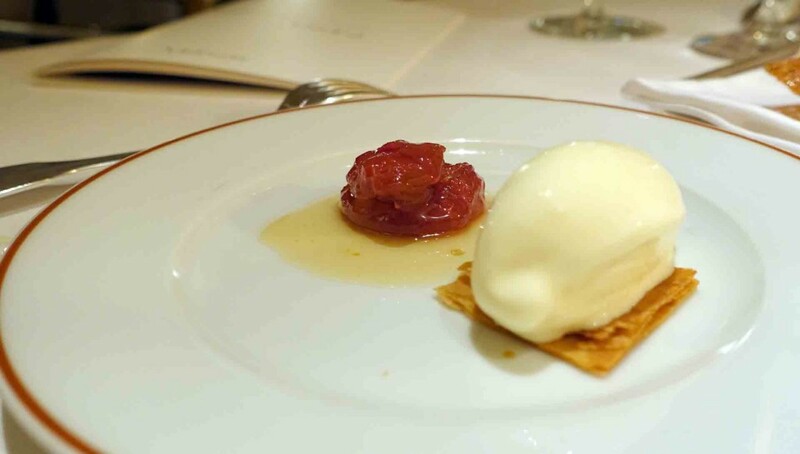 The first of our desserts took us back to the tomato. Confit in twelve different flavours the tomato was sweet and juicy. The ice cream was melt in the mouth and really brough the dish together. And for our final dish of the evening we had rhubarb tart. I was unbelievably full by this point (seems like the waiters won the bread game!) and so I had asked in advance for small portions of the dessert…a decision I regretted. Once again Passard just let the natural flavours stand out. He didn’t feel the need to complicate the rhubarb and just brought out the extraordinary in what many other chefs would deem ordinary and in need of a foam or a mist. Slightly tart and with a perfectly buttery light base this was the perfect end to the meal. 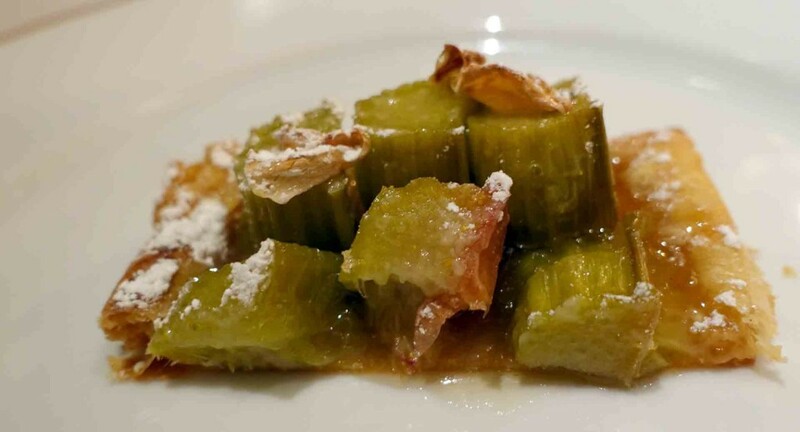 Bright, vivid, fresh, clean, uncomplicated…not usually words that spring to mind when it comes to French food but these were the overriding themes throughout our meal at L’Arpège. Despite the menu focusing on vegetables the meal was intensely satisfying (even for my boy!) and I think it would surprise even the most carnivorous. 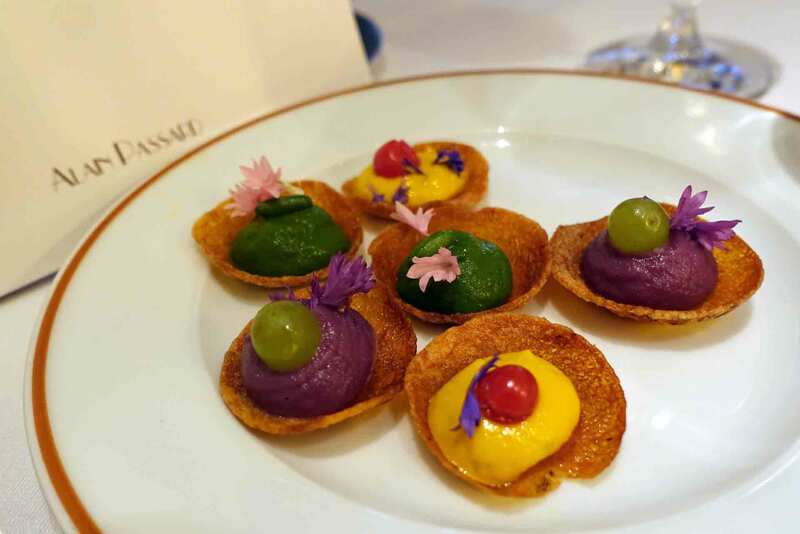 Unlike many restaurants trading on the name of a famous chef who is never actually there, Alain Passard is almost always cooking and is a constant presence in the restaurant – flitting in an out the dining room to chat to the diners and present his dishes. The waiters were attentive and fun and very generous with the (surprisingly reasonable) wine. As well as delicious food there is a great atmosphere. L’Arpège is not cheap but it is outstanding and out of the ordinary. 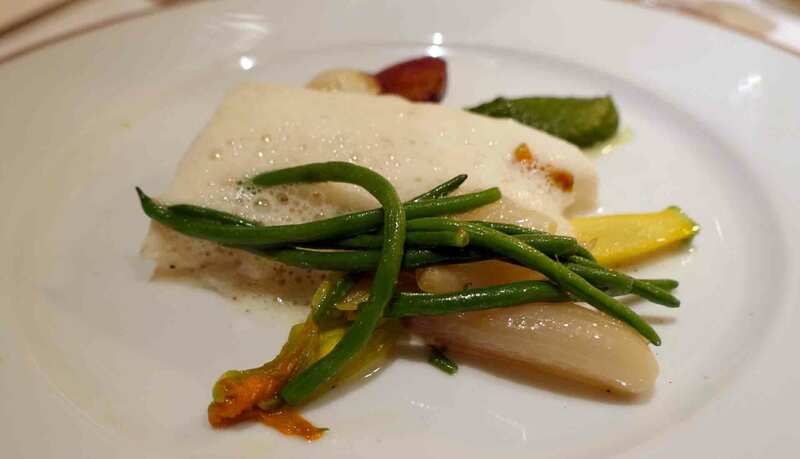 The restaurant can be found on 84 Rue de Varenne, 75007 Paris, France (the wonderful Musee Rodin is right across the road if you fancy a walk to work up an appetite or get your digestion moving after a lunch menu). For more on the the Musee Rodin check out my photo diary of our weekend here. 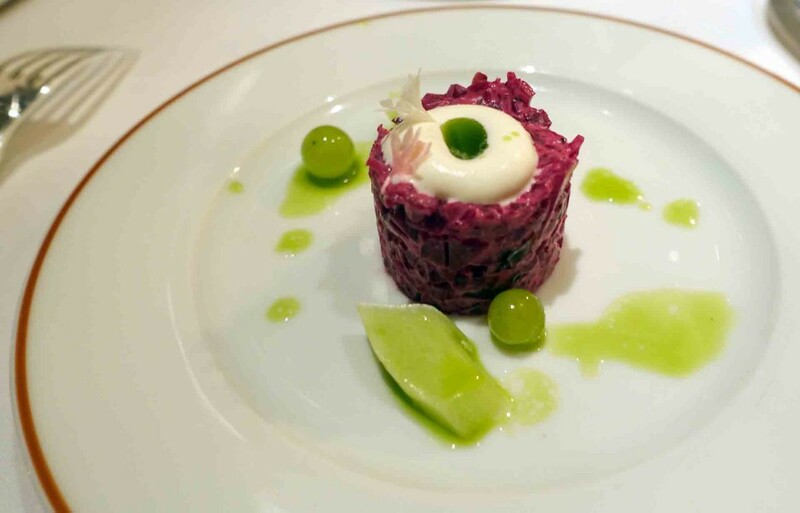 This entry was posted in eat and tagged Alain Passard, France, Michelin Star, Paris, tasting menu, Three Michelin Star, world’s 50 best restaurants. Bookmark the permalink.